Our Safety Hand Held Mini US Flags are safe even for kids, thanks to its no tip design which prevents the risk of eye injuries and poking even when these are used in crowded parades on National events and holidays like July 4th, school rallies or national celebrations. 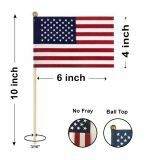 Made of polycotton material, these Safety Hand Held Mini US Flags are available in two different styles, a no tip design and a safety ball top model. 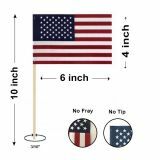 Our handheld Mini US Flags are secured with wood staples to a wooden staff, have a matte finish, and are produced with a no-fray material, which requires no hemming. The traditional flat cut edges provide a neat appearance. Safety Hand Held Mini US Flags from Tuff Flags are well suited especially for events like school sprit rallies and children’s events as these can be used with significantly lower risks. If you are scouting for beautiful yet safe to use Hand Held Mini US Flags, look no further than Tuff Flags. Should you need any tips or assistance, we are only a call away. Reach us at our toll free number (888) 287-3524 or email at customercare@tuffflags.com and we will assist you.